Flicking through Madame Magazine for the latest Spring/Summer 2014 trends recently, I've discovered that one of my favourite styles is still en vogue this year: Polka Dots. This timeless pattern started to conquer the fashion world in the 50’s and had its big revival around 2008/2009. Michael Kors used an amazing dress for his catwalk show at London Fashion Week and I immediately thought it’s about time to get my dress back out. 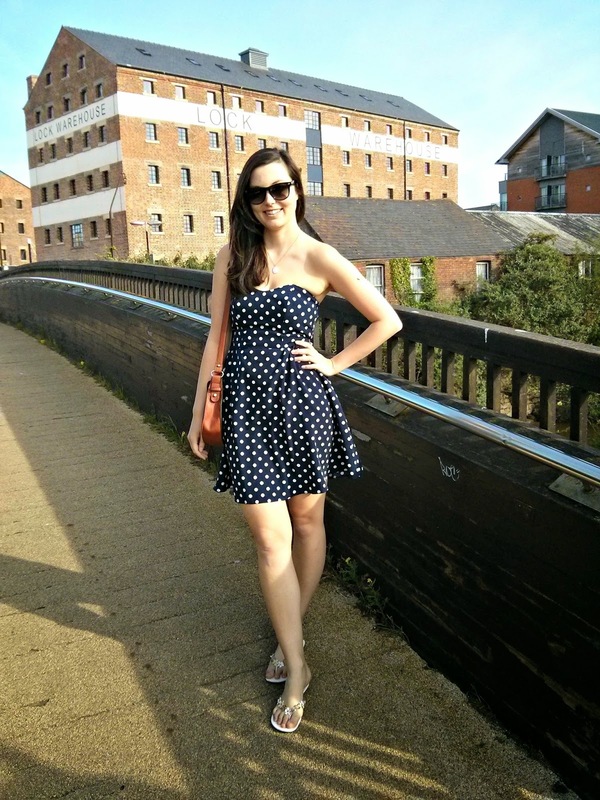 I’ve got a blue, strapless dress from ASOS in my wardrobe and wore it today. I love to style my ASOS Polka Dot with brown or red accessories. Blue dresses combined with a white or red cardigan give the outfit a maritime touch. Polka Dot dresses are so versatile when it comes to styling, clearly a classic and timeless wardrobe essential! Thank you so much for checking out today's ootd post. Hope you've enjoyed my polka dot dress. I'm really sorry this OOTD post only has one picture. During my blog move in April 2015, I've lost some of my pictures and unfortunately, this post was affected.